“Guide Spam” — is it out of control? There’s a lot of advertising in the guide you see above. This happens to be from a DIRECTV DVR but it’s the same situation on most major pay-TV companies’ guides. It’s become a bit of an epidemic, and it even reaches to streaming providers. Roku sort of pioneered the notion of advertising in the menu, and you also see it in a lot of streaming apps as well. More ads in the guide banners. Ugggg. But it’s a way to make money. I remember seeing a prototype guide that had a lot of imagery and ads in it, similar to what we finally got. My point is, this isn’t a new situation. It’s been in the works for some time. Can you get rid of guide spam? If you have a DIRECTV receiver there’s an easy way to take all those banners out of the guide but you won’t like it. 1. Set up a favorites list. You’ve probably already set up a favorites list. If you haven’t, press the MENU button and scroll to Settings, then over to Favorite Channels. You can have two different lists and you can automatically add channels you get so it’s easy to get started. 2. Go to the guide. Find a banner you want to get rid of. Trust me this will not be hard. There are banners all over the place. 3. Tune to the channel under the banner. If the banner is above channel 229, tune to channel 229. 4. With the info banner at the top, scroll over to Favorites. One of the options will be “Remove from …” Remove the channel from the favorites list you’ve just set up. That’s all it takes. 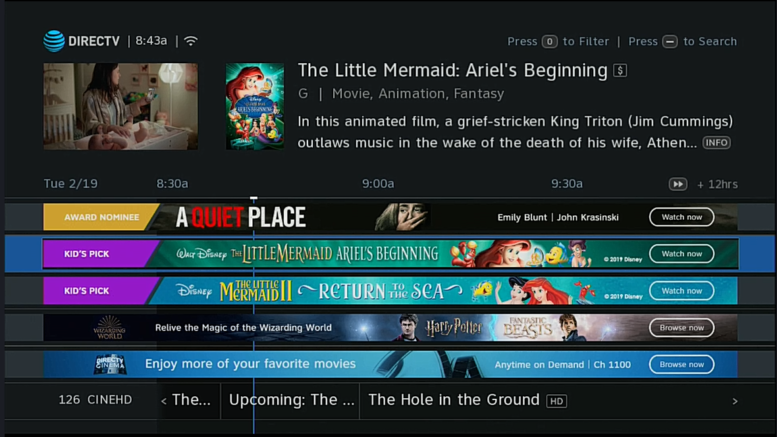 The guide banners are tied to the channels below them so if you remove that channel from the guide, the banner goes with it. Of course there’s just one problem. If you remove that channel from the guide you won’t know what’s on. See, I told you that you wouldn’t like it. Some guide banners are actually useful. The ones that point to movies are very useful, since they give you instant on-demand access rather than your having to time out your viewing to line up with the airtime of the satellite-delivered version. No one wants to wait to see a movie right? Guide banners also tell you about programs you might want to see. Yes, I understand that they take up room in the guide and that you might occasionally have to press the page-down button one time more than you had hoped, but after all the concern dies down, they’re just not that bad. Frankly they’re a bit of a relief from the doom and gloom of a grey-and-black menuing system. It’s nice to see a pop of color there. So, yes it’s true that there’s a way to limit the number of banners in the guide. The cure is worse than the disease though, so it’s probably best to just live with them. Updated: Hands on with DIRECTV’s Generation 2 DECA! Can you use multiple TVs with a DIRECTV receiver?